Auhle’s way requires a lot more bandaids. Special thanks and shoutout to the Impure Blood fan who stopped by to chat at the Sioux Empire Fair last week. Nathan didn’t catch your name, but he’s looking forward to reading your book on the genetics of domestic chickens. Or at least recommending it to someone who understands that kind of thing. Nathan is back in the Twin Cities for a few days before heading back west to Rapid City, for the Central States Fair. Stop on by all ye South Dakotans who want to see a caricature cowboy in action. He’s probably willing to talk about Impure Blood, too. Thanks as always for reading and don’t forget to share our links on Facebook and Twitter! Hey, Dara! Haven’t seen her in awhile! But is that the same conversation they’re having? I’d have thought they’d have made some more progress by now. No, no… That was the villain revealing his evil plan part. This here’s the training montage. 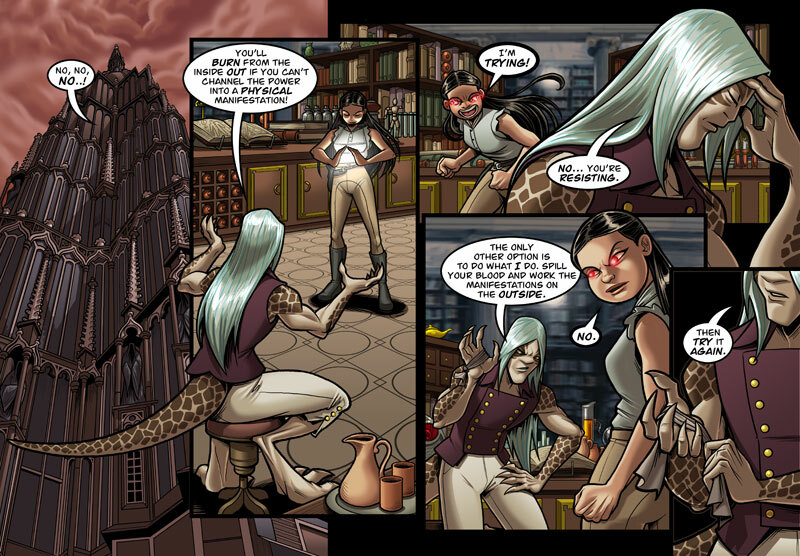 Auhle is surprisingly trusting of Dara, though I suppose an Oath to the End of the Blood is pretty serious business. But maybe he doesn’t remember the part about not being able to lie and have the oath still binding–he lied to her about the existence of ancient(s). That is part of his plan, that she is committing to help with I’m thinking that lets her out of the oath.